CanStockPhoto kovalvsHere's a simple analogy for incident, problem and change that I use quite a bit. "When you are up to your arse in alligators it's hard to drain the swamp". Previous story: why on earth did ITIL V3 rename Forward Schedule of Change to Change Schedule? Next story: COBIT 5 taskforce - who will steer the next generation COBIT? Submitted by Azia (not verified) on Wed, 2009-09-16 12:43. "When you're up to your ar** in alligators it helps to remember you're there to drain the swamp"
to be a pretty dumb one. It just pushes back to the question of why you want to drain the swamp? Well of course you want to drain the swamp so you can have some solid land as beach-front in Florida so you can build a golf course for the condominium retirement home for rich retired stock brokers so you can make piles of money and go live on a yacht in the Bahamas. So when we go on about the details of fencing, nesting, gates and all that, we're just reverting back to techie-geeks and forgetting that the real business of business is to do business and make a profit. Never ever forget the economic motive. Submitted by skeptic on Wed, 2009-09-16 20:05. When you want to try to build something in IT, often the IT techs are the ecological activists, up in arms over the destruction of the habitat of their beloved alligators. We hire techs because they love to solve problems. it is only one step in attitude to love problems. How many techs do you know who relish problems? Polish them and show them to everyone before they reluctantly put them down bacuse that's their job. After they do, they preserve them in a jar, telling folk about them for ages afterwards. Submitted by JamesFinister on Tue, 2009-09-15 20:48. LOL. No, hold on, I never say that. LOLgators? 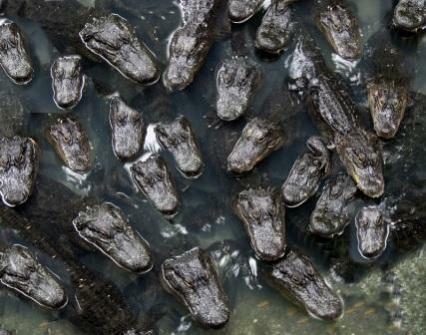 Alligators aren't the problem. They've been around for thousands of years. The problem is when alligators and people have to co-exist. Both of us have legitimate aims. And alligator shooting doesn't solve the problem, in fact it could cause a lot more unexpected incidents - I would say that was major incident management. Problem management has more dimensions to it. Standard change = relocating rogue 'gator to a new location? Change management has to be multi dimensional - change one element and you get a sub optimal solution? Draining swamp etc. misses the point. Why do 'gators exist? Why do we want to eradicate them? Wouldn't life be easy if we eradicated business driven changes? Question: Who are the 'gators? Submitted by dschofie on Wed, 2009-09-16 09:41. Does the charging'gator have to bite you before you take action? I can't help but think that 'real, perceived or threatened deviation from planned and agreed service behaviour' would align better with the customer/users expectation of something that merits creation of a Service Incident (SI). Thus don't wait to be bitten before starting to manage the situation with the appropriate urgency. If for example 1 of 2 clustered nodes has failed then manage the SI according to whether you still have 100% capacity to meet the expected service level or not and what service impact you would have if the second node fails before the first is restored. Managing the associated but separate Problem(s) of why the node failed might be done to a different tempo. Submitted by Visitor (not verified) on Wed, 2009-09-16 11:45. Submitted by skeptic on Wed, 2009-09-16 10:48. You're falling into the same trap Dave. "The only way to manage the situation with the appropriate urgency is via an Incident". No it isn't. there is an entirely different process if a 'gator is getting too close than there is if it has already bitten you. in the same way, the process to resolve a fault is different to the process to resolve an incident for all the reasons outlined here, but it is addressed with urgency. Submitted by DaveT (not verified) on Wed, 2009-09-16 22:09. "there is an entirely different process if a 'gator is getting too close than there is if it has already bitten you." Submitted by skeptic on Wed, 2009-09-16 22:56. Good point. reactive problem management is shooting a gator that has shown itself to be a man-attacker. That common response of going out to shoot a maneater once someone is dead. To be controversial, I also categorise incident matching and other trend analysis as reactive problem management not proactive. You're still using bites as evidence. Submitted by DaveT (not verified) on Thu, 2009-09-17 15:15. I tend to your point 1. I would sit on the porch and shoot every gator that showed himself. Submitted by skeptic on Thu, 2009-09-17 19:50. Submitted by JamesFinister on Tue, 2009-09-15 20:50. I could imagine a whole book/training course/philosophy base around this idea.